Heat extra virgin coconut oil in a large skillet over medium heat; cook and stir onion and garlic in the hot oil until onion is soft, about 5 minutes. Add spinach to skillet; cook and stir until spinach is wilted and cooked down, 5 more minutes. Stir olives, feta cheese, lemon rind, salt, oregano, and white pepper into spinach. Cook until feta cheese has melted and flavors have blended, about 5 more minutes. Spread spinach mixture into a 9×13-inch baking dish. Arrange tilapia fillets over spinach mixture. Mix butter and lemon juice in a small bowl and drizzle over fish; sprinkle with paprika. 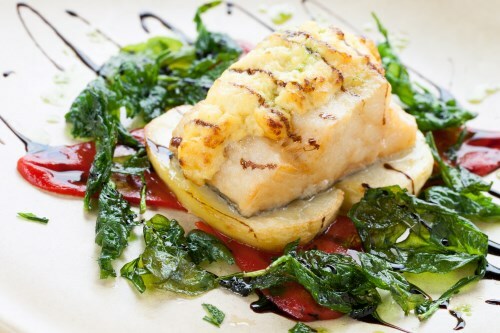 Bake fish in the preheated oven until the flesh is opaque and flakes easily, 20 to 25 minutes.